A bidding process was completed with the aim of guaranteeing the renewal of Bogotá’s massive public transportation system, Transmilenio. The tender 01 involves the arrival of more than 1,000 new buses, including 481 powered by natural gas (302 biarticulated and 179 articulated). The CNG buses, manufactured by Scania, will operate on the Suba, 80th Street and North routes. It is the largest urban bus sale in the history of Scania. The 481 NGVs meet Euro 6 standards, which helps reduce particulate matter by more than 98%, NOx by 96% and CO2 by 20%, compared to most of the buses that currently circulate in the city with Euro II technology. These three types of polluting materials are the main cause of diseases and deaths due to respiratory problems. 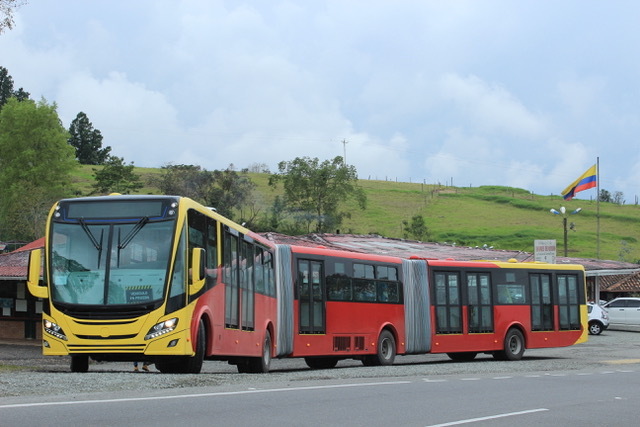 The 302 biarticulated buses will have 340HP and capacity to carry up to 250 passengers, while the 179 articulated units will feature 320HP engines and capacity for up to 160 passengers. The 481 vehicles will be produced at the Scania Latin America plant in São Bernardo do Campo, São Paulo, Brazil. “The Scania Euro 6 natural gas buses are a reality in European urban transport, and since 2015 a total of 227 of these buses operate in the city of Cartagena. Thus, Colombian authorities and operators have been able to verify that this technology is ideal for urban centers. With our technology, the pollution is drastically reduced and the vehicles generate less noise than those than run on diesel, a truly sustainable solution,” said Juan Carlos Ocampo, Managing Director of Scania in Colombia. Mayor Enrique Peñalosa reiterated that the bus tender for Transmilenio is a huge advance for the city, since they will reduce polluting emissions by up to 86% compared to the old buses that will be replaced. “There is a huge improvement for Bogotá’s air quality. Today, we have buses with Euro II technology and now we are going to switch to Euro V and VI buses, with 41% of the new fleet running on natural gas,” commented Peñalosa. “Bogotá is going to have a massive public transport system with modern technologies that will reduce pollution in the city for the benefit of the citizens’ health,” added the general manager of TRANSMILENIO S.A. María Consuelo Araújo, who also informed that the first vehicles will begin arriving gradually in mid-2019.